Arranged by Gary Meisner. Accordion. Latin. 72 pages. Published by Hal Leonard (HL.310932). ISBN 0634053051. 9x12 inches. Arranged by Gary Meisner. 20 Latin favorites expertly arranged for accordion, including: Amor • Aquellos Ojos Verdes (Green Eyes) • Bésame Mucho (Kiss Me Much) • The Girl from Ipanema • How Insensitive (Insensatez) • Miami Beach Rumba • Perfidia • Poinciana • Spanish Eyes • So Nice (Summer Samba) • This Masquerade • What a Diff'rence a Day Made • and more. Includes lyrics. I am pleased to find the Intermediate level. Good addition to my musical library. Many of these pieces I didn't have. Like the arrangements also. MEMORIZE ANY OF THESE, ADD YOUR OWN SCHMOOZING IN THE BELLOWS, LOOK HAPPY, AND YOU HAVE A GUARANTEED WINNER. THANK YOU GARY MEISNER. I ALWAYS ENJOY YOUR INTRODUCTIONS. THANKS FOR INCLUDING SOME SPANISH LYRICS. HOW ABOUT SOME PORTUGUESE? HASTA LA VISTA. 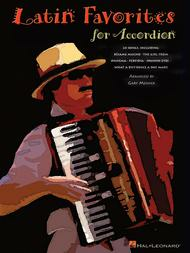 ItÂ´s beautiful book for accordion players and I am satisfied about this. This book contains some very recognizable selections. Some you have to hum in your head to recognize them because of the Spanish names. Intermediate level, and pleasing arrangements. A good addition to anyone's library.